I'm big on planning. I always have a jumble of projects bouncing around my mind and clamoring for my attention (not to mention my time). I admire the photos in Interweave Knits and various pattern books, and I think about all the changes I would make to the patterns in order to make the finished projects "my own." I dream of yummy yarns in delicious colors, and of hours of meditative browsing time at local yarn stores. 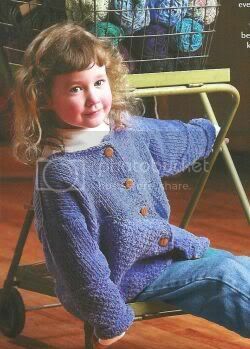 Unfortunately, despite my plans, 2004 was not a great knitting year. I spent a lot of time nursing my newborn and chasing my preschooler. My DH was laid-up after major surgery. I returned to my part-time job. I managed to complete a few knitted projects (mostly because I gave up cleaning my house). And I spent a day at Rhinebeck, which did wonders for my soul. But I spent a lot more time thinking about knitting (and reading other peoples knitblogs, while nursing) than actually knitting. I have bigger hopes and dreams for 2005. Sure, the kids aren't going anywhere. Yep, I'm still working. But I'm going to figure out how to get one of those time-warping necklaces that Hermione had in The Prisoner of Azkaban, and I'm going to use it so that I can make at least a few of the following items. (2) Something for my toddler: a spring-weight Pilot Cap from a Little Turtle Knits pattern (scroll about halfway down the page). I made her a beautiful winter weight one, but it was way too big for this year. I have already started a swatch for this using a wool/cotton blend from Cascade. 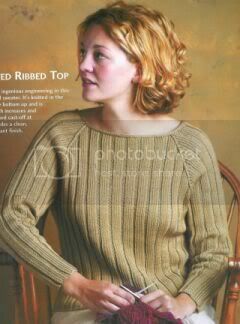 Although I actually swore off knitting sweaters, I am sorely tempted to try this one, from Knitter's Stash. It calls for EuroClip cotton, but I am thinking about using Cotton Fleece (by Brown Sheep) or maybe one of the Debbie Bliss yarns. I am hoping to spend some time browsing at Webs soon in the hope of getting a deal on a suitable yarn. (4) For DH: I will finish the evil nine year sweater. A Sophie bag, embellished with needle felting. A necklace knit with wire. Mittens to donate to our fundraising auction at church. Another moebius, maybe a spring/summer wrap.